to view the full 19 pages of the document. 1. Maple™ is a package for doing symbolic (and numerical) mathematics. (b) Evaluate the characteristic polynomial of the matrix. eigenvalues of the matrix. Check your result by hand. represented by the state matrix. Which is the same as obtained by hand, after a little reduction. use for Matlab™ is the factoring and multiplication of polynomials. Use these four commands on the above polynomial. This function is not order dependent. Problem set 2 solution: maple is a package for doing symbolic (and numerical) mathematics. In this class we will use it for some linear algebra with symbolic state matrices. Type the following command to load the linear algebra library: with(linalg); This gives access to all linear algebra functions. A matrix, a, is defined using the following syntax: Compare this to the result obtained with the command charpoly(a,lambda). the eigenvals( a) command. Check your result by hand. to evaluate the. Find: use maple and hand calculations to (a) evaluate the characteristic polynomial and (b) the eigenvalues for the system represented by the state matrix. 0 (b) evaluate the characteristic polynomial for the state matrix, by evaluating !i " a : = 0 # !i " a = ! 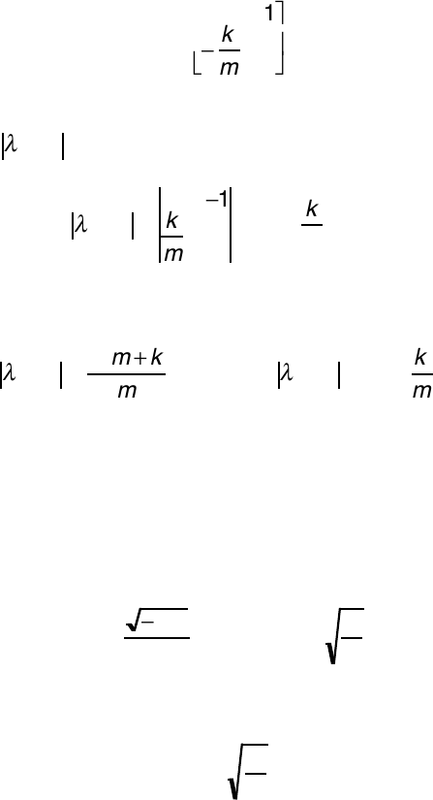 k m. Which is the same as obtained by hand, after a little reduction.